Alandi, a town 25 kilometres from Pune, in the Pune District of Maharashtra, is a revered pilgrimage site for a number of reasons, but foremost is the fact of it being the home of the 13th-century Maharashtran saint, Sant Jnaneshwar (Jnanadev). In fact, Jnanadev spent most of his short life (1275-1296 C.E.) in and around Alandi, finally taking maha-samadhi there. Jnanadev is mostly known for his poetry, a commentary on the Bhagavad-Gita known as the Jnaneshwari and a poetical-philosophical work known as Amritanubhav. Jnanadev was one of three brothers and a sister born under strange circumstances to a sannyasin named Vittalpanth and his wife, Rukmabai. Vittalpanth was initiated into sannyasa by a guru named Swami Ramananda without disclosing to the master that he was married. When, through a twist of fate, Ramananda discovered that not only Vittalpanth had been married but that also his former wife was heartbroken over his renunciation, he ordered Vittalpanth to return to householder life. After this, the four children were born to the couple, all of whom came to be considered as mahatmas. As it was a violation of sannyasin dharma to live the life of a householder, Vittalpanth and his family were exiled by the Brahmins of Alandi and treated as pariahs. The remainder of the short life of Jnaneshwar, and of his brothers and sister, is filled with miraculous stories and moments of philosophical triumphs throughout the state and the country. One such story involves Jnaneshwar demonstrating his yogic power to animate insentient objects by “riding” a wall. This wall still stands in Alandi. The Jnaneshwari was the first commentary written on the Gita in a language other than Sanskrit. Jnaneshwar desired to bring the wisdom of the text to the common man of Maharashtra, and he knew this was only possible if he broke with tradition and composed it in Marathi. When Jnaneshwar was only 22, he told his friends and siblings that he desired to enter maha-samadhi, which he did on a cave in a hill in Alandi on the 13th day of the dark half of the month of Kartik in 1296. He was still alive when the tomb was sealed. It is said that anyone who read the Bhagavad-Gita at his samadhi will have all his doubts removed. Initially, Mumbai was not part of mainland India as it is today, but a string of several islands, which the British began connecting in 1782 and completed in the early 1900s. It is believed that one of the settlements in this string of islands was known as Mumba Devi. 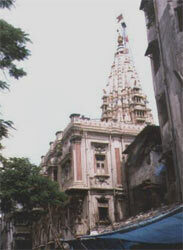 A Mumba Devi Temple where people come to worship the patron goddess stands today in the Kalba Devi area of Mumbai. The original temple was at the Phansi Talao (Gibbet Tank) on the city’s Esplanade, within the current limits of Chhatrapati Shivaji Terminus. Although the original temple managed to escape demolition during Muslim and Portuguese rule, it was demolished by the British in order to provide additional space for fortifications in the mid-1700s. The temple was rebuilt in it current location in 1830. The general belief is that the original temple was constructed in the late 14th century. “It is stated therein that in times of yore, there lived in this island a very powerful and mighty giant bearing the name of Mumbarak, and the island had derived its name from him. ‘By means of austerities he pleased Brahmadev and prayed to him to be favoured with a blessing that he would be incapable of meeting with death at anybody’s hands, and that he would ever prove successful. ‘Having once secured the blessing, he set out to harass both people and the Gods on earth. All the Gods therefore proceeded en masse to Vishnu to seek his protection and prayed to him to destroy their foe. “Upon this, Vishnu and Shiv extracted a portion of lustre, each from his own body, and made of it a goddess or Devi for the destruction of the giant. The goddess then beat Mumbarak almost to death and threw him down on the ground and told him to ask for a blessing. He entreated her to join his own name with hers and to perpetuate that name on earth. It was on the train line between New Delhi and Calcutta, sometime in the middle of the night. The Rajdhani Express pulled into the station at Lucknow, and chanting rose from the platform: “Om Amriteshwaryai Namaha!” the voices called out. “Om Amriteshwaryai Namaha!” Devotees were there, yearning for at least a glimpse of their Beloved Mother and Guru, Amma, Whom they knew to be travelling that night on that train. Would they have the blessing of seeing Her? They must have been praying hard, for She emerged from Her compartment and ran to the door of the carriage. “Can you open it?” She asked Jani, one of Her American daughters who was there in the corridor. Jani tried to open the latch, but couldn’t. But Mother was not to be stopped: She leaned down to the door window, and smiled lovingly at Her children there on the platform. They surged forward, reaching out to touch Her —or, at least to touch the glass between them and Her. She pressed Her palm to the window, matching it to a son’s palm pressed there on the other side. Then again, and a daughter’s hand was “touched”, even though through the glass. The crowd was ecstatic, and pushed forward. E everyone must have this beautiful darshan! And it seems everyone did. With the kind help of the police who stepped into “line monitor” roles, pushing people forward and pulling them back, each devotee was able to come as close as possible to Amma. What love poured through that train window —that obscure piece of glass which both joined and kept apart this loving Mother and Her eager children! Holi is an extremely popular festival of India and it is common to all sections of society with it’s origins going back to ancient times. Also known as ‘Holika’, it has been mentioned in very early religious texts such as Jaimini’s Purva mimamsa-sutras and others. It must have therefore existed several centuries before the common era and has been common all over India for millenia. In India festivals are the fabric of scoiety that binds it together creating a happy and harmonious atmosphere. All the festivals carry within them social, religious and spiritual messages. Even so in this scheme of things Holi has a special place and purpose. In most cases festivals involve fasting and other austerities but in the case of Holi the opposite is the case. It is the time of the year when we are given free reign to express our desires and release some pressure by acting out in a controlled manner what has been building inside us for the rest of the year. Like a pressure cooker might explode if not taken care to let out some steam, likewise the festival of Holi serves the same in our psychological make-up. In this way we clean the slate in order to begin the new year afresh without stagnated and repressed vasanas pulling us down. The purpose of Holi is not to celebrate only the positive emotions but in some cases it serves as a legitimate way of expressing negative emotions might also be called for. 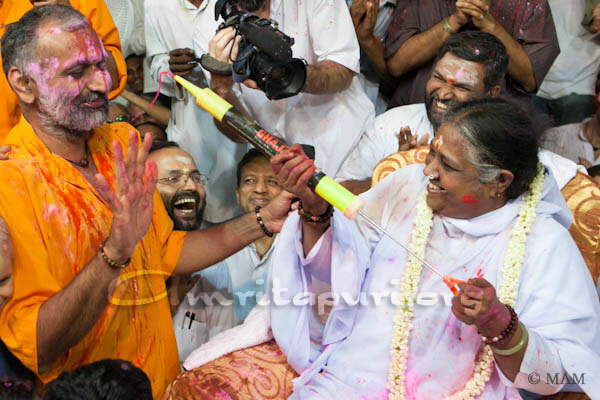 In such a tradition, on Holi, it is not completely unheard of to slap someone gently who has been a source of consternation to us during the rest of the year. Naturally this should not be used as an excuse for wanton eratic behaviour and should be done with a spirit of good humor as Holi is after a festival of friendhsip and joy, with the express purpose of healing society and preventing negative tendencies from overwhelming us. 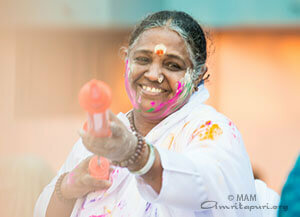 Another aspect of Holi is to help us break the barriers we have built around ourselves and our ego. Usually we are very protective of our personal space and will not let anyone violate that. During Holi such rules do not apply and the whole purpose is to behave in such a way as to bring down those walls in ourself and others and let go. Suddenly there is no difference between us and others. We slip into a state of oneness in which everyone is equal. This is the special beauty of Holi. Worship of fire is also an important part of Holi as in the this process we offer our vasanas to Agni in order to trancend them eventually. Worshipping the fire during Holi also ushers in the warm season ashead as we move to the new year, marking the end of winter and the abundance of the upcoming spring harvest season. The colours of Holi are also a reflection of our joyful emotions and desires beeing now freely expressed. In the olden days the colours themselves that were used were natural and organic thus serving the dual purpose of being healthy for the body as well as healing our psyche. Nowadays this is not the case as the artificial colours we use are rather harmful and even toxic. The ayurvedic principle has been lost. Like all Indian and Hindu festivals, Holi is inextricably linked to mythical tales and commemorates the victory of good over evil. There are at least three legends that are directly associated with the festival of colors: the Holika-Hiranyakashipu-Prahlad episode, Lord Shiva’s killing of Kamadeva, and the story of the ogress Dhundhi. Hiranyakashipu was king of the asuras. Hiranyakashipu’s brother had been slain by Lord Vishnu for terrorising gods and goddesses. As a result, Hiranyakashipu wanted to destroy Lord Vishnu and keep the other gods subdued. He told his soldiers to crush all those who worshipped Vishnu, but Vishnu protected his devotees. Hiranyakashipu thought to himself, “I will have to match my powers with Vishnu’s to rule over the three worlds”. So, he began performing tapas (severe austerities). When he was thus occupied, the gods ransacked his city and destroyed his palace. Hiranyakashipu’s wife, who was expecting a child, was sent to Sage Narada’s hermitage. There, she learned about religion and the glory of Lord Vishnu under him. Narada taught the Queen that Lord Vishnu was the soul of all created things and that he was present everywhere. The child within her, Prahlad, absorbed all this knowledge too. Meanwhile, Hiranyakashipu’s austerities pleased Lord Brahma who said, “Arise Hiranyakashipu. Any boon that you ask of Me shall be yours”. Hiranyakashipu said, “I wish that my death be not caused by man or beast, with a weapon or without a weapon, during day or night, indoors or outdoors, on earth or in the sky. Grant me the undisputed lordship over the material world”. Lord Brahma granted him the boon. Hiranyakashipu then brought his wife back to his city where Prahlad was born. 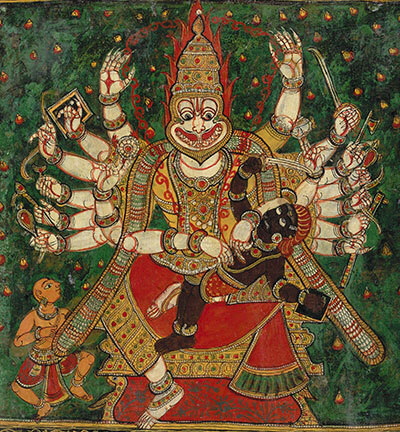 Hiranyakashipu, with his new powers, renewed his hostilities against Vishnu and His followers. He declared, “There is none stronger than I. I am the lord of the three worlds. I shall be worshipped as such”. The soldiers attacked Prahlad when Prahlad was meditating on Lord Vishnu, but their weapons could not touch Prahlad. Deadly snakes were let loose on Prahlad, but their fangs turned impotent. Mighty elephants could not trample him. He was pushed off a cliff but Prahlad was unharmed. In desperation, Hiranyakashipu had him fed with poison but it transformed into nectar in Prahlad’s mouth. It was on this day that Holika, Hiranyakashipu’s sister who had a boon to brave fire without being hurt, tried to kill Prahlad by taking him on her lap and sitting on a burning pyre of wood. Holika was burnt to ashes while Prahlad remained unscathed! Thus, the Holi festival signifies the burning of self-conceit, selfishness, greed, lust, hatred and all other negative tendencies and actions, and the victory of righteous forces over demonic forces. In the case of Prahlad his father was unimaginably cruel towards him, yet his faith gave him shelter and protected him. The monstrosity of Hiranyakashipu was more than most could endure but Prahlad kept praying to the Lord who eventually in the form of Narasinmha, destroyed Hiranyakashipu and installed Prahlad on the throne who then went on to rule wisely for many years. he moral of this story is that whatever adversities life may bring forth our faith should remain unwavering. There are practically no religious observances such as fasting or worship on Holi. Generally, a log of wood will be kept in a prominent public place on the Vasantapanchami day (Magha Sukla Panchami), almost 40 days before the Holi festival. An image of Holika with child Prahlad on her lap is also kept on the log. Holika’s image is made of combustible materials whereas Prahlad’s image is made of non-combustible ones. People go on throwing twigs and other combustible material onto the log as it burns. On the night of Phalguna Purnima, it is set alight in a simple ceremony during which the Raksoghna mantras of the Rigveda (4.4.1-15; 10.87.1-25 and so on) are sometimes chanted to ward off all evil spirits. Coconuts and coins are also thrown into this bonfire. The next morning the ashes from the bonfire are collected as prasad (consecrated material) and smeared on the limbs of the body. Singed coconuts, if any, are also collected and eaten. 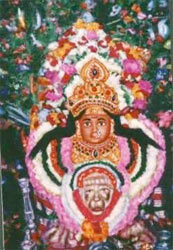 In some houses, the image of Kamadeva (the god of Desire) is kept in the yard and a simple worship is offered. A mixture of mango blossoms and sandalwood paste is partaken as prasad. The day, Phalgun Krishna pratipada, is observed as a day of revelry during which people throw gulal or coloured water or perfumed coloured powder on each other. The people of Bengal observe this festival in a quiet and dignified manner as Dolapurnima or Dolayatra (the festival of the swing). The festival, said to have been initiated by King Indradyumna in Vrindavana, is spread over 3 or 5 days, starting from the sukla Chaturdasi of Phalguna. The main features of this festival are a celebration in honour of Agni and the worship of Govinda (Krishna), an image of whom is placed on a swing. The swing is to be rocked 21 times at the end of the festival. Also, the fire kindled on the first day is to be preserved till the last day. 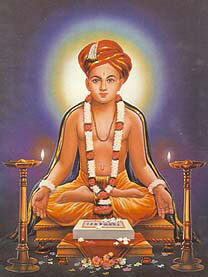 The day is also celebrated as the birthday of Sri Krishna Chaitanya (A.D. 1486-1533). 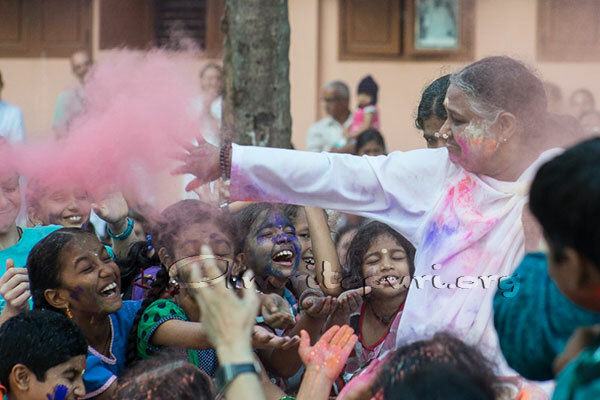 Holi was, at first, a ritual performed by married women for the happiness and well-being of their families. They worshipped the full moon deity. Thus the full moon festival of Holika gradually became a festival of merrymaking, announcing the commencement of the spring season. Here we see how beatifully the Indian festivals entwine with the natural cycles marking important advents of the solar year. All the festivals are co-ordinated in such a manner as to give people a feeling of participating in a cycle larger than themselves and in so helping to tune in with the cosmic forces inherent in nature. The following perhaps explains the other names of this festival: Vasanta-Mahotsava and Kama-Mahotsava. According to the stories in the Puranas and various local legends, this day is important for three reasons. It was on this day that Lord Siva opened his third eye and reduced Kamadeva to ashes. It was also on this day that an ogress called Dhundhi, who was troubling the children in the kingdom of Prthu (or Raghu), was made to run for her life, by the shouts and pranks of the mischievous boys. Though she had secured several boons that made her almost invincible, the noise, shouts, abuses and pranks of boys became a chink in her armour due to a curse from Lord Siva. The day itself came to be called “Adada” or “Holika” since then. The stories of Sri Krishna’s boyhood pranks which so delighted the gopis (cowherd maids) of Vrindavan also form the essence of Holi. Though older than Krishna, the gopis were so charmed by Sri Krishna’s play that they themselves became like children again. Sri Krishna and the gopis are depicted as celebrating Holi in the hamlets of Gokula, Barsana and Vrindavan, bringing them alive with their mischief and youthful pranks. Holi was Krishna and the gopi’s celebration of Love. This teasing, affectionate panorama of feeling and colour has been captured and immortalized in the songs on Holi. 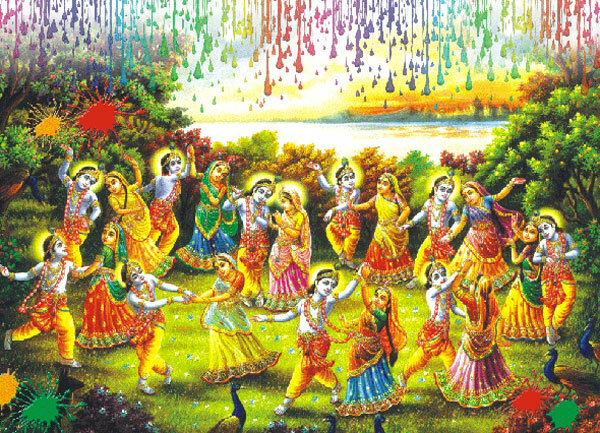 Holi is also celebrated in memory of the immortal love of Lord Krishna and Radha. The young Krishna would complain to his mother Yashoda about why Radha was so fair and he so dark. Yashoda advised him to apply colour on Radha’s face and see how her complexion would change. In the legends of Krishna as a youth he is depicted playing all sorts of pranks with the gopis or cowgirls. One prank was to throw colored powder all over them. So at Holi, images of Krishna and his consort Radha are often carried through the streets. Holi is celebrated with great enthusiasm in the villages around Mathura, the birth-place of Krishna. So let us also join together free from the binds of our self-created barriers and feel the happiness of Holi, forgetting ourselves and glimpsing the eternal joy residing in our soul. Question: Amma, you seem to be giving more importance to bhakti (devotion) than to any other path. Why is this so? Amma: When you say bhakti, do you mean just repeating a mantra and singing devotional songs? That alone is not bhakti. True devotion is discriminating between the eternal and the ephemeral. It is to surrender oneself to the Infinite. What Amma advises is practical bhakti — that is, how to apply bhakti in our day-to-day life. The children who stay in the ashram read many books and they ask Amma questions. Amma usually gives them answers along Vedantic lines. However, while talking to the general public, Amma stresses devotion because 90 percent of the people are not intellectuals. They haven’t studied the scriptures, and so it is not possible to teach them the principles of the scriptures in just one day or by one darshan. Hence it is wiser to give them advice that they can actually live by. But Amma also advises them to read the scriptures. Advaita (non-duality) is the basis of everything. But it is practical devotion rooted in advaita that Amma advises. Most of the people who come here have little knowledge of spirituality. They are simply in the habit of visiting temples. Only about 10 percent of the people give importance to reason and follow a different path. But Amma cannot neglect the others; they also need to be uplifted. So Amma gives advice according to the level of each person. The prayers and devotional singing at the ashram are not just prayers — they are spiritual practices that are done to awaken the real light within us. They tune the individual consciousness with the Universal Consciousness; they allow us to expand from the level of body-mind-intellect to all-pervading consciousness. There is no need to search for a God sitting somewhere beyond the sky. God is the all-pervading Supreme Consciousness. Still, we advise people to meditate on a form because a medium is necessary to make the mind one-pointed. To construct a ceiling made of concrete, we first have to make a wooden frame, and it is on that frame that we pour the concrete. When the concrete has set, we can remove the frame. This can be compared to worshiping a divine form. In the beginning, a form is necessary to concentrate the mind and to develop true knowledge; but once the mind becomes fixed on the Supreme Consciousness, there is no longer any need for any adjuncts or instruments. Only if we are humble can we receive God’s grace. Egoism has no place in the person who beholds God’s consciousness in everything. So the first quality that we need to develop in ourselves is humbleness. The aim of praying and singing hymns is to cultivate that humbleness. There should be humility in our every look, word and deed. When a carpenter takes up a chisel, he first touches it to invoke a blessing. The chisel is just an instrument he uses for his work, and yet he offers pranams to it. We, too, do the same thing when we begin to play the harmonium. Why should we offer pranams to our own instruments? It is to behold God in everything that we do this. In this way, our ancestors were aiming to remove the ego in us. Similarly, prayer is an expression of humbleness, and is a means of eliminating the ego in us. Some people may ask “Can’t we pray in silence?” For some people it may be necessary to read in silence, while for others reading aloud is more effective. We cannot tell someone who reads aloud when studying, “Don’t read so loudly! You should read quietly, like I do!” Some people get more concentration by praying aloud, while others prefer to pray quietly. Similarly, for different types of people different spiritual paths are required. No path is basically different from another, because everything leads to the Supreme Principle. In each case we have to take into consideration how practical it is for us and move accordingly. There are some who complain, “Amma, when I meditate with my eyes closed, a lot of thoughts continuously arise in the mind. When I sing bhajans and pray, I get full concentration.” The purpose of our sadhana (spiritual practices) is to make the mind one-pointed. The Vedantins who deny everything by following the “neti, neti” practice, saying, “I am not the body, nor the mind, nor the intellect,” are trying to realize the Supreme Self. This is also the purpose of prayers and bhajans. Is there any religion in which devotion and prayer doesn’t have a place? You will find it in Buddhism, Christianity and Islam. And in every religion there is the Guru-disciple relationship. The Guru-disciple relationship can even be found on the non-dualistic path. So even on that path, duality, Guru and disciple exist. And isn’t devotion to the Guru devotion itself? Through our prayers we are trying to imbibe the divine attributes; we are trying to realize the Supreme Truth. Prayer is not the method of a weakling — it is a powerful step towards God.